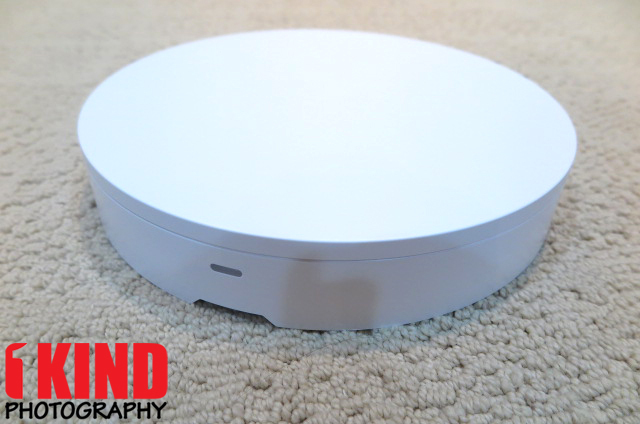 Overview : Foldio360 is a smart turntable that allows you to create stunning 360 images. All you need is the Foldio360, your smartphone, and a light box. Foldio360 was designed to be available for everyone, no matter if you are an amateur or professional photographer. 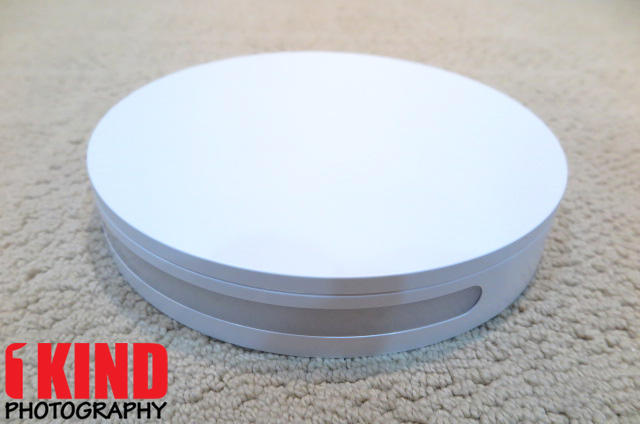 Foldio360 is easy and simple to use, but creates high quality 360 pictures. FOLDIO360: The Foldio360 is a smart turntable that allows you to create 360° images using just a smartphone. Create your own stunning 360° images with the Foldio360. 360° IMAGES AT YOUR FINGERTIPS: Foldio360 is designed for everyone. 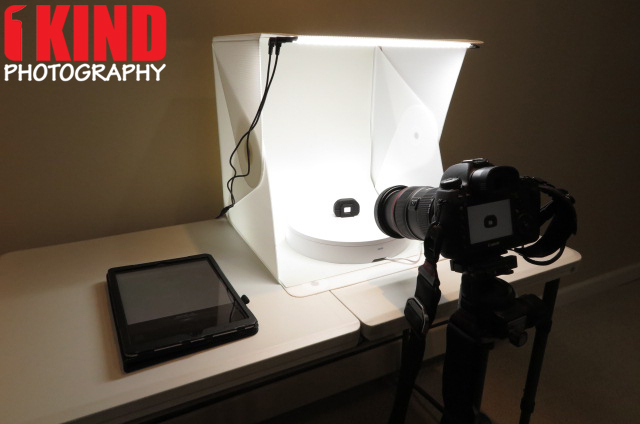 All you need is a light box and your smartphone or DSLR camera to use the Foldio360. Now it's easy to create 360° images. Pairs nicely with the Foldio2 (sold separately). AUTOMATIC SHOOTING SYSTEM: The Foldio360 uses Bluetooth and IR sensors to connect directly with your smartphone and DSLR camera. Once you click the start button, it will automatically rotate, take photos and combine them to create one final 360 image. It’s truly simple, but incredibly awesome. HALO EDGE LIGHT SYSTEM: Experience 360° images to the next level. Foldio360 has a unique feature called Halo Edge light system to further enhance the quality of your 360° images. 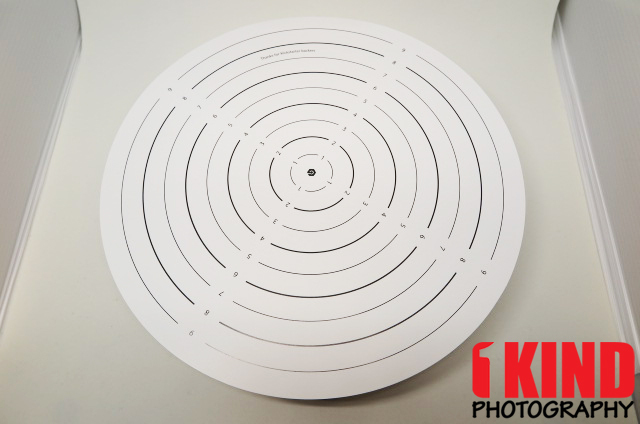 This helps eliminate any boundary line to create high quality 360 images. Quality/Usability : If you do product photography or sell on eBay or Etsy, this may be the product you've been looking for. The Foldio360 is a portable motorized turntable that rotates your product 360°. It can work as a standalone or with the Foldio2 15" Portable Light Box. This is a great way to show your products off in 360° fashion. 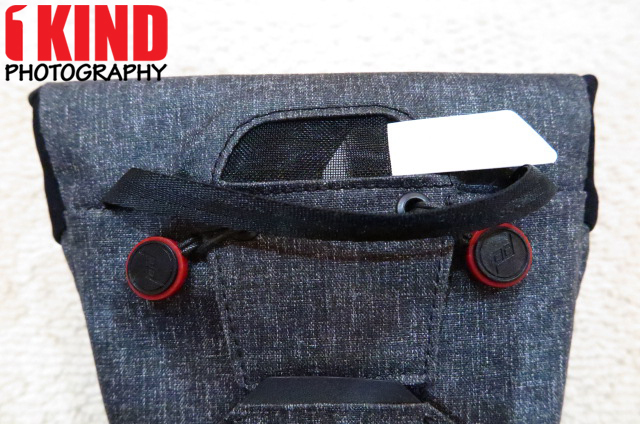 The Foldio360 measures 250mm x 250mm x 40mm (10 inches x 10 inches x 1.7 inches) with Bluetooth 4.0 (BLE) and IR sensor that connects directly to your electronic device (smartphone, tablet) and DSLR cameras. The front of the Foldio360 is where your IR (InfraRed) is located. This is what communicates with your DSLR camera. Below the IR sensor, this is also where the power adapter comes out from. Even though the Foldio360 measures at 10 inches x 10 inches, that is the base. 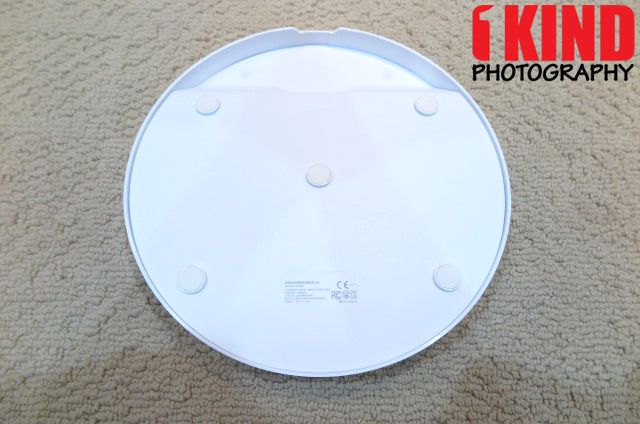 The base is wider than the turntable itself which measures approximately 9.81250 inches x 9.81250 inches. The Halo Edge lighting has 45 cells with a Daylight 5700k. The brightness can only be controlled through their Foldio360 app. The Halo Edge light only activates when the app is in use, otherwise it won’t activate. It would have been great if there was a dial or something that would let you control the brightness manually. The bottom of the Foldio360 has five rubber feet that keeps the Foldio360 planted on the surface. There is also a spot to insert the power adapter and a small black button. This button is to change your modes. Hold down the button for 3-seconds and it changes it to Display mode. Display mode lets the Foldio360 spin constantly until you hold the button down for another 3-seconds. When Display mode is active, the Halo Edge light and Bluetooth connectivity is disabled. The power adapter of course powers the unit. It would have been nice if the cord itself was a little bit longer. I had to move my setup closer to an outlet. 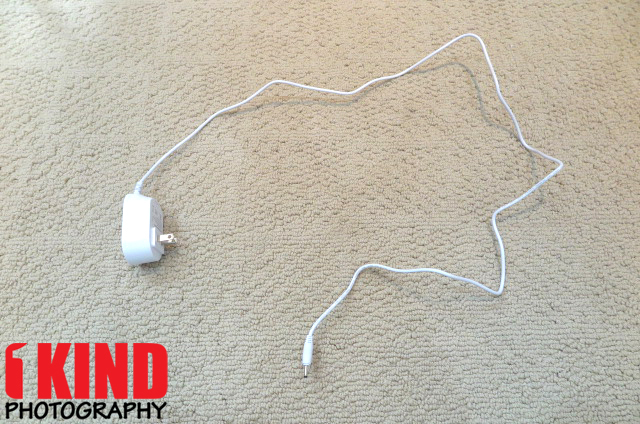 If you don't want to move or have a specific location, you can use an extension cord. If you are using the Foldio2 or another portable light box that has lights, you'll probably need a power strip that has additional outlets. One of the Stretch Goals on Kickstarter for those who backed them, received black and gray color sheets. If they are going to include black and gray, they should of included green as well to match their backdrops. It would have been nice if they offered these to all Foldio360 purchases or made them available for sale. 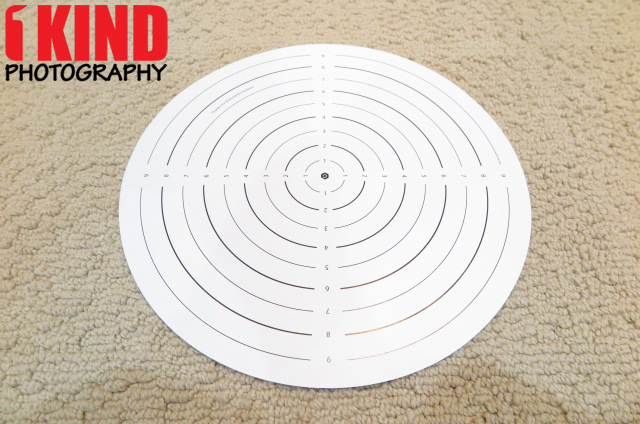 Since they don't offer these for sale, you can purchase the extra backdrops for about $15-$20 and just cut them to the size of the turntable. 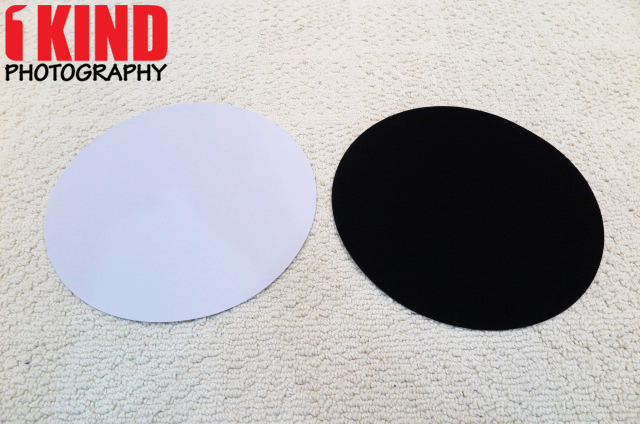 You can get two or three circles from each backdrop and an extra white backdrop in case it gets dirty. The other Stretch Goal was a center guide film. When you think film, you think of something transparent. Instead, what they provided was a center guide printed on thin cardboard paper. If this is not included with Foldio360 purchases, it could have been made available for purchase or made the template available for print — after all, they did have a prototype of it printed on paper. With Orangemonkie's center guide, it stuck out a little from the edge. Below is my own center guide that I created from scratch prior to Orangemonkie sending me the exclusive Kickstarter Stretch Goal items. 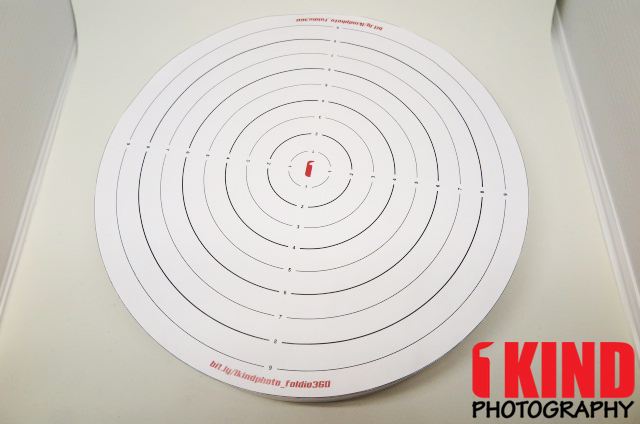 PRINTING INSTRUCTIONS: Since the Foldio360 is just shy of 10x10, it will not print on 8.5x11 (Letter/A4) paper unless you print in halves and tape them together or print on 11x17 (Tabloid/A3) paper or if you happen to have 11x17 transparency film. Once printed, all you have to do is cut out the circle. If you want it to last longer, you can laminate it as well. 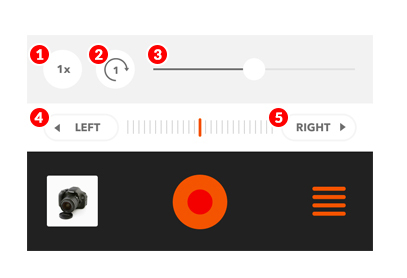 The Foldio360 turntable uses their own Foldio360 app, that lets you control various parameters (iTunes and Google Play). Open the Foldio360 app, setup your shot, and press start. When you click the start button, the turntable starts rotating automatically and the camera begins to take pictures. Images are then stitched or combined together for a 360° view. It can take 24, 36 or 48 images. The less images it takes, the more choppy it will be and the more images, the smoother it will be. When using the app with an electronic device (iOS and Android), in addition to the ability to control the Halo Edge light, you can also control image resolution, focus, zoom, exposure compensation, color balance and composition grids. This allows you to connect to your electronic device whether it be an iOS device or Android. You will be using your iOS or Android device to take pictures and control the Foldio360 through the app. Color (iOS only) : Control color temperature. You can alos control the color temperature by swiping the screen left and right. Gyro : This function helps you check the horizontal balance by using gyro sensor. Help : It shows the description of screen. You can also export your file to Facebook, Twitter, Instagram or ZIP file (JPG, GIF, MP4) to the cloud or to your email. 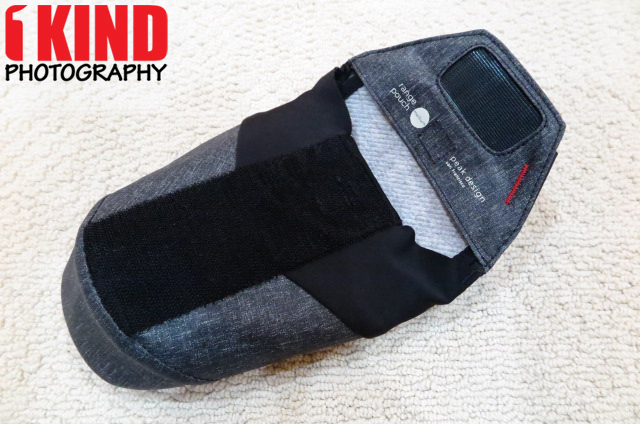 Foldio360 communicates with your DSLR camera through IR (InfraRed) technology. All you would need to do is put your camera in remote control mode in addition to your typical settings such as aperture, shutter speed and ISO. Speed : Rotation speed. Choose a desirable rotation speed depending on the subject’s weight. Frame : Choose the total number of photos. We recommend 24 or 36 frame setting for sharing online. Halo Edge : Control the Halo Edge light brightness. 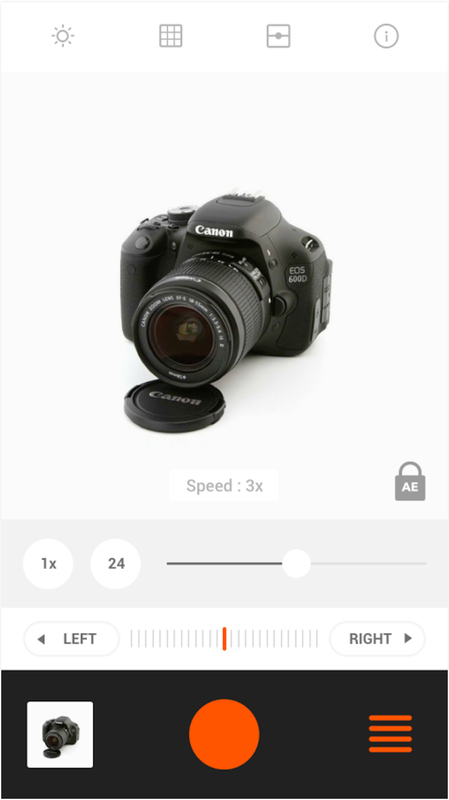 It helps you to create a clean image with camera brightness function. Rotate left : Rotate the turntable to left direction manually. Rotate right : Rotate the turntable to right direction manually. There is a chance that the automatic shooting can stop even though the Foldio360 keeps rotating. It means that the image processing speed of your camera is slower than the Foldio360’s rotation speed. All you would need to do is go into SETTINGS on the Foldio360 app and change the IR Delay to match that of your camera. This lets you record a video of the product spinning on the Foldio360 instead of taking individual images. At the time of this review, it is only available for iOS. Android support will be coming soon. This will not work with DSLR cameras. This mode basically allows you to control the angle degree of the turntables rotation. You can have it automatically do a complete 360° spin or infinite (constant spin). You can also control it manually. If you're using your smartphone or tablet, the images are sent to your electronic device. The app can easily stitch together the 360 product image. But if you're using a DSLR, you can transfer the images to your computer and use a program like Photoshop to make your own animated GIF. Orangemonkie also has a site called SPINZAM. It is an online platform where you can upload and store your images onto the Foldio site and directly link it to your store, social media or another site — or embed the image directly. With SPINZAM, your customer has the ability to rotate the images themselves manually. 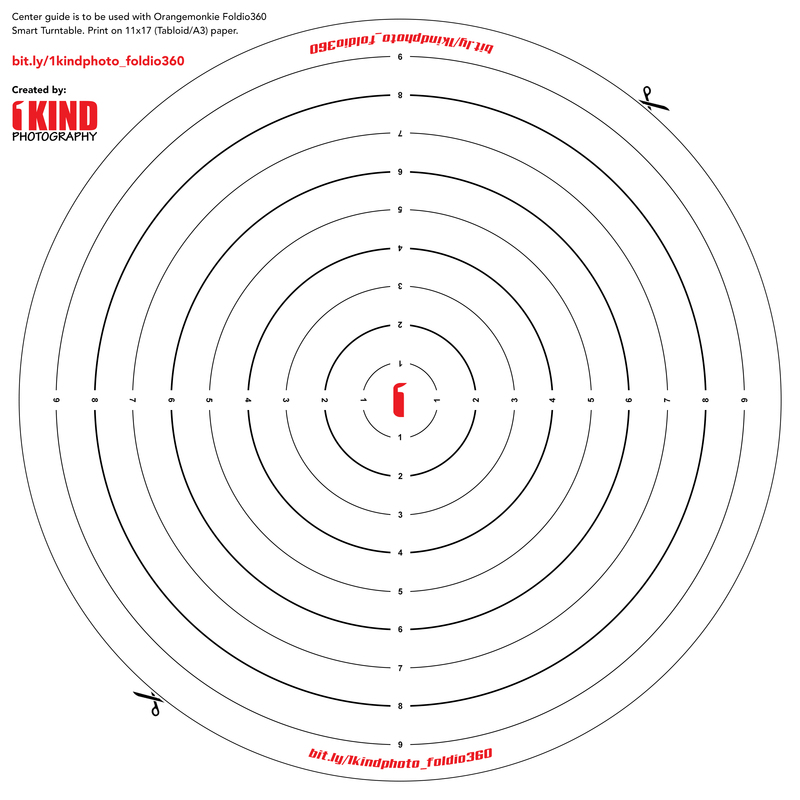 As you can see, if uploaded through SPINZAM, the user has the ability to rotate the image. If I create it myself, its automatically animated and constantly rotates. I'm sure if you're technical enough and have a place to upload scripts, you can probably set it up yourself. 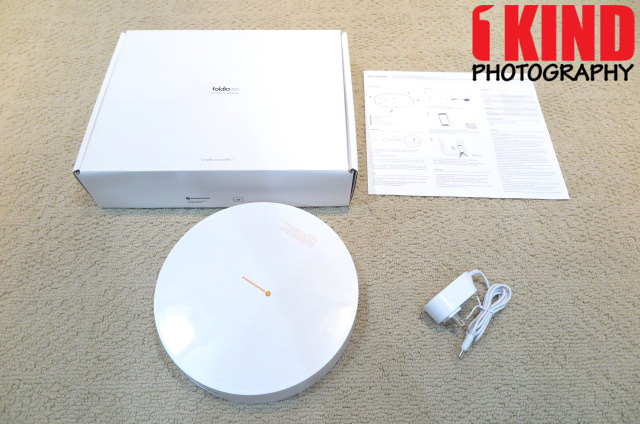 Conclusion : Overall, the Orangemonkie Foldio360 Smart 360° Product Photography Turntable is a nice product for product photography. If you sell online whether it be eBay, Etsy or at a local flee market, this is a must. It's very easy to use, the app gives you control not only on the Foldio360 but also the images. I love the fact that I can also put it in display mode and just let the turntable spin non-stop. This is a great way to show off your product at events, tradeshows or even at special events like a big birthday party or wedding. I would of liked the ability to control the Halo Edge lighting not only through the app but also manually with a dial or something on the Foldio360. What if I just wanted to use it as a display or something? I would have to open up the app just to turn on the light. I wish that I was able to export the interactive rotation from SPINZAM's website and host it on my own instead of on theirs. It would of been also nice if they included or at least offered to sell the Kickstarter Stretch Goals as I feel they are important to the Foldio360. 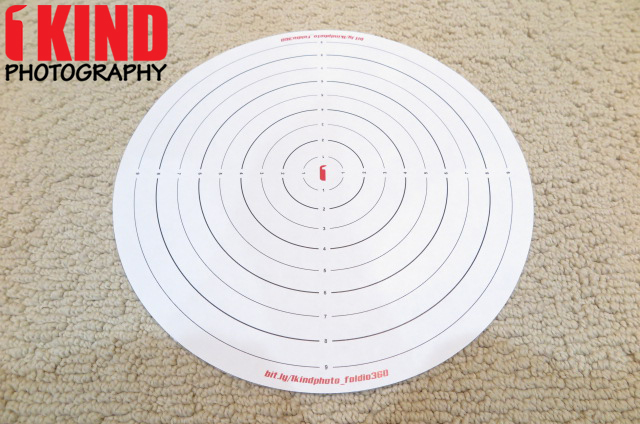 Luckily, there are alternatives such as purchasing the extra backdrops and cutting them out and printing out our center guide template. One of the most popular/visited reviews on our site is the JJC EC-6 Eyepiece Eg Extender. If you're not familiar with the eyepiece extender, it extends the eyecup 5/8" (15mm) from the camera body. This is useful for eyeglass wearers and others to keep the tip of the nose from touching the camera screen. Canon does make their own EP-EX15 and EP-EX15 II eyepiece extender but they don't fit any of the more recent EOS cameras. We have been getting emails on where the aftermarket eyepiece extender can be purchased from. Unfortunately, they are discontinued and no longer being made even though the Canon eyecup (Eg) is still being used on current and new Canon cameras. 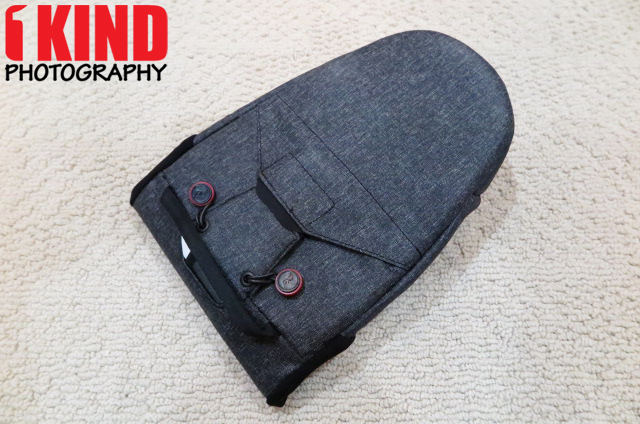 Aftermarket : The 3rd party extender came with its own eyecup with a flat back which is slightly different from the Eg eyecup that comes with your camera. 3D Printed : Grooves were cut out so that the OEM (Eg) eyecup that came with the camera can be used without have to buy new ones. If you lost or need replacements, you can purchase from Amazon, B&H Photo and Adorama. Aftermarket : The 3rd party extender came with a cheap plastic lens to "help" magnify your view. 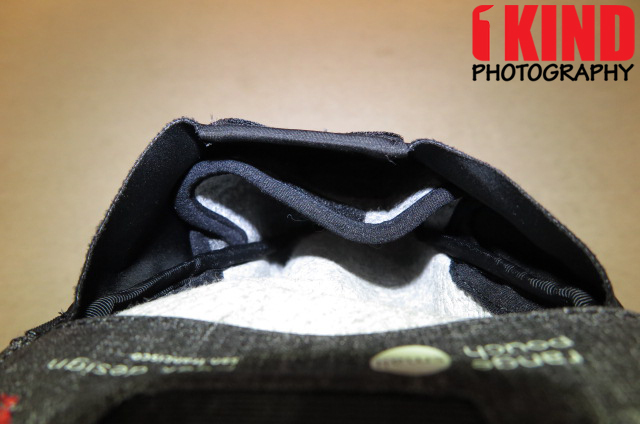 3D Printed : Sole purpose of this is to extend the eyecup so that your face is not near or touching the screen. Also, the plastic lens only made your view even more distorted. One thing that will still be the same is that some of the corners may be cut off when looking through the viewfinder because your view is now further away. Also, the viewfinder and OEM eyecup is rectangular while the extenders opening is a square. So this will require you to make slight adjustments to the positioning of your head when looking through the viewfinder. If you're looking for an extender and your camera is not listed above, take a look at our DIY: Nikon/Canon DSLR Camera DK-17M Magnifiying Eyecup/Eyepiece Mod for a list of other Canon compatible extenders. 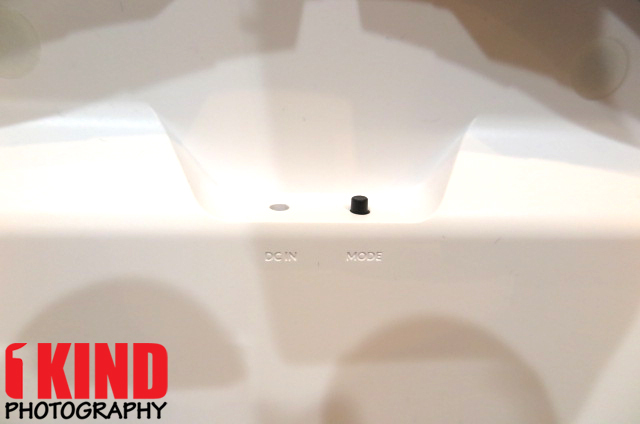 Here are images of the 3D printed eyepiece extender on a Canon EOS camera. All prices include extender(s) and shipping costs. In stock item(s) are shipped out within 1-2 business days after payment has been received and cleared. For any purchases of 3 or more, please contact us for discount (may require some additional time to print if not enough in stock). If there are any questions or for quicker shipping method, please contact us prior to purchasing. PLEASE LEAVE FEEDBACK BY LEAVING A COMMENT BELOW. Thank you again for your business. All shipping include tracking number and is handled by USPS.com. International shipping is delivered by local courier. Need it quicker? Let us know. MAKE SURE YOUR ADDRESS IS CORRECT. WE ARE NOT RESPONSIBLE FOR ANY LOST PACKAGES OR MIS-DELIVERED PACKAGES. 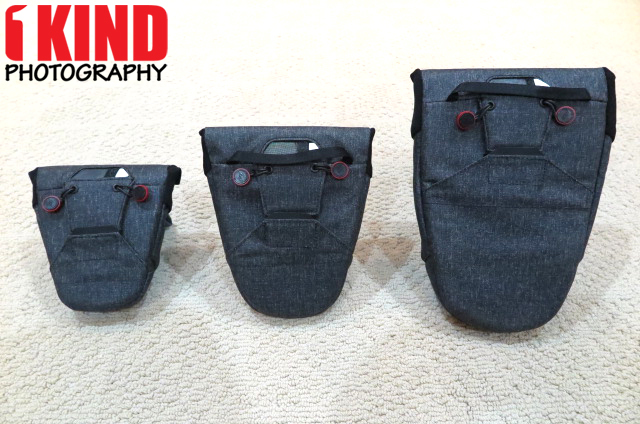 Overview : Whether you’re toting a lens (or two), flash, mic, drone, tape measure, or other oft-used piece of gear, Range Pouch will keep it secure, protected and instantly accessible. And it does so with a low-profile design, clean aesthetic, and thoughtful features that you won’t see in other pouch systems. 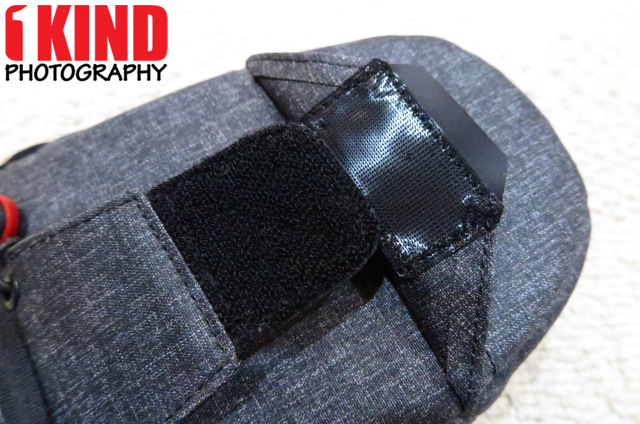 Sturdy belt loops allow mounting without removing your belt. Expandable opening with silent, unidirectional hook-and-loop closure facilitates lightning-fast access. 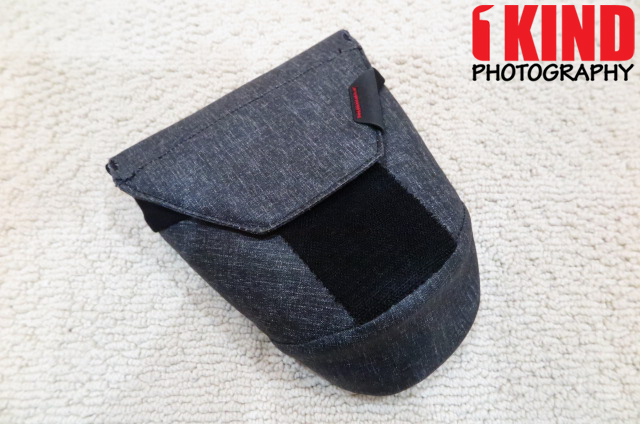 Thick premium felt padding protects, and folds down to allow stacking of multiple smaller lenses or items. Anchor attachment points let you carry Range Pouch with any Peak Design strap. Quality/Usability : When Peak Design announced the Everyday Backpack, Everyday Tote and Everyday Sling to their Kickstarter campaign, the Range Pouch was a late addition. But I'm glad that they added it. These are a great compliment to the Everyday bag line and even as a standalone. 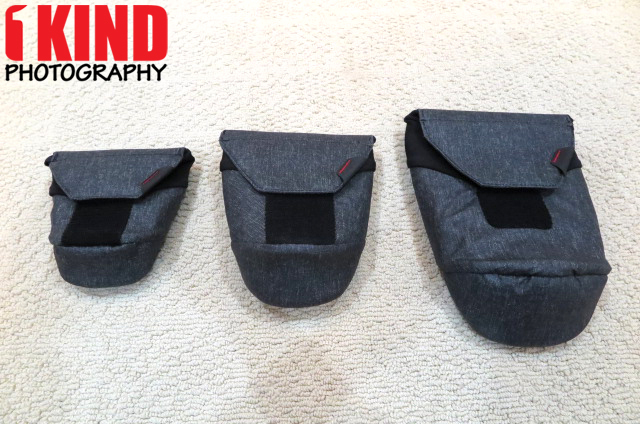 The Range Pouch comes in three sizes: Small, Medium and Large. Unfortunately, if you own other Peak Design products that are either in the Heritage Tan or Ash, the Range Pouch only comes in Charcoal...at least as of this review. They may release Range Pouches in other colors in the future. The small is best for pancake and prime lenses. The medium is best for prime lenses and mid-zooms (i.e. 24-70). The large is best for mid-zooms and telephoto lenses (i.e. 70-200). Peak Design says that it can fit with lens hood but from what I have tried, it fits best without. 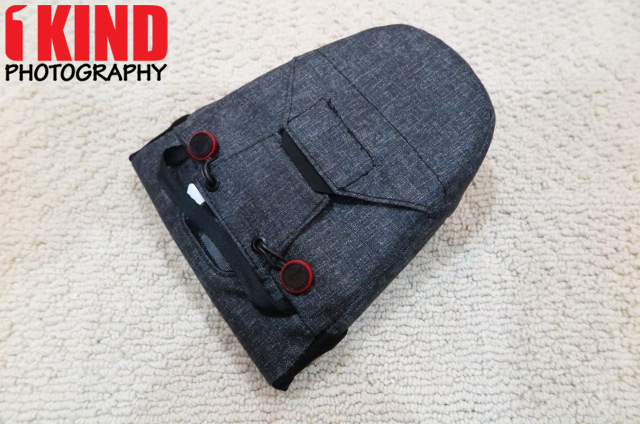 The lens hood just adds more bulk and not only makes it harder to insert into the Range Pouch but to also close. The front of the Range Pouch has a long strip of velcro. This allows you to close the flap as low or as high depending on how much room there is to close the flap. When you lift the flap, you can either lift it up as normal which would result in the typical velcro sound. Or you can pull down on the flap and than lift away. This will result in a much quieter opening of the cover. 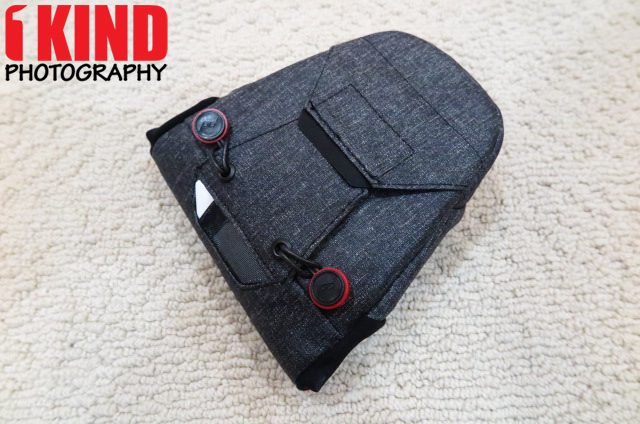 During my testing, I was able to fit smaller items into the small Range Pouch such as batteries, smartphone, chargers, etc. With the medium, I actually used it to carry my G1 X Mark II during my trip to Disneyland. And with the large, I was able to fit a 20 oz. water bottle, flash, telephoto lens and larger items. I do not own a DJI Mavic Pro drone but Peak Design has shown pictures of the drone fitting into the large pouch WITH the controller. 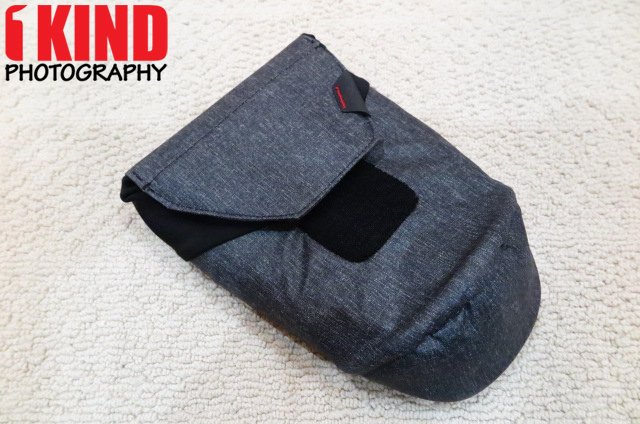 Inside all three sizes of the Range Pouch, you have your main compartment as well as a small pocket to store batteries, memory cards, ID, money, etc. It's kept closed with velcro. Tucked inside the flap is a felt flap. 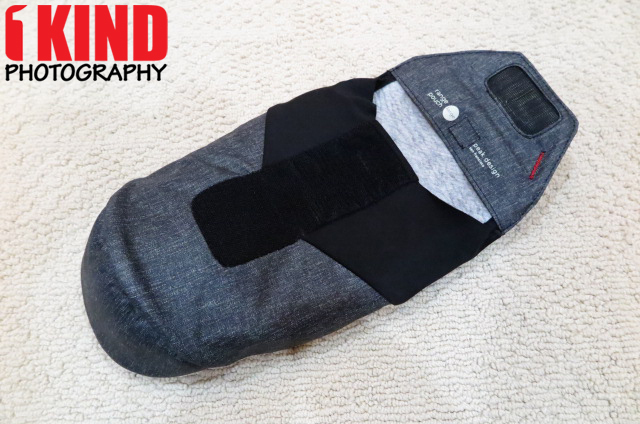 This allows you to fold it down into the main compartment which will allows you to stack multiple lenses and offer protection. 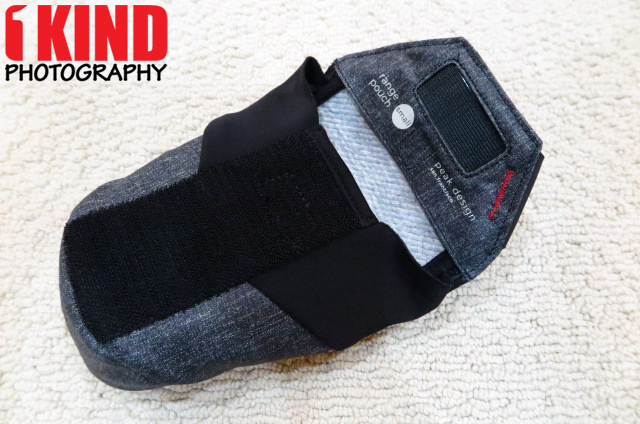 Take a look at our video below for better demonstration and view of these pockets and flap. On the back of all the Range Pouches, you have a small mesh pocket with a plastic card. This lets you label your pouch or add whatever information you want to add. They also included anchor links for you to attach either the Peak Design Leash, Slide, Slide Summit Edition or SlideLite (all sold separately). 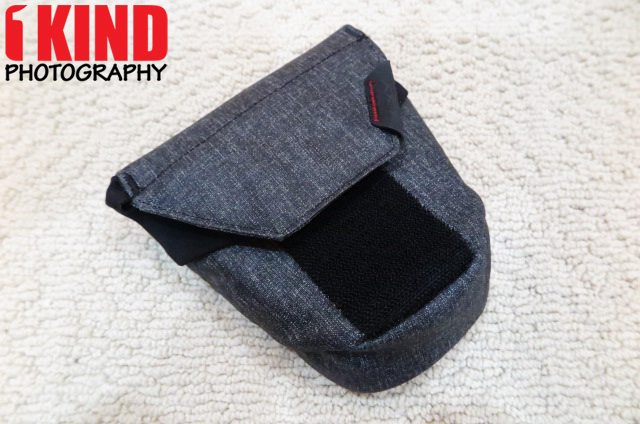 The medium and large Range Pouch are the only two pouches that come with a handle on the back. 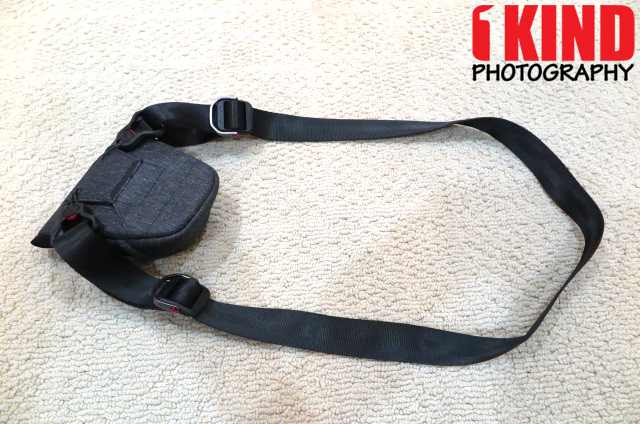 If you don't want to use a strap to carry the Range Pouch, you can wear it with a belt either by sliding your belt through the pouch or by loosening the velcro and putting it over your belt. 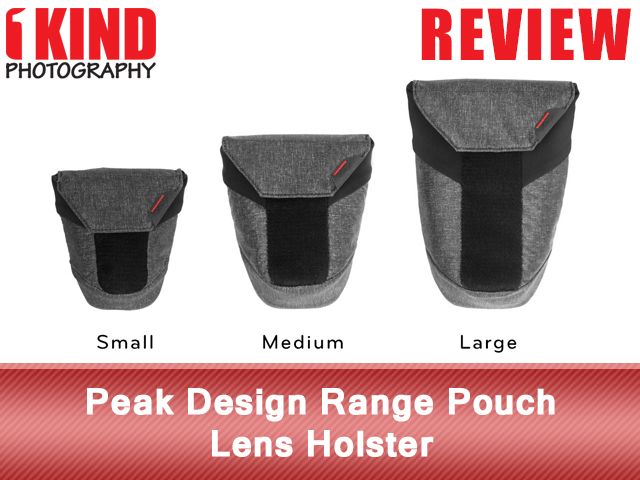 Conclusion : Overall, the Peak Design Range Pouch Lens Holster is great if you want to keep smaller items near your or even your lenses. These make great carry cases without the added bulk. Although the pouches may hold and protect your gear nicely, I would of may be liked the sides to have a little bit of elastic so that it can expand easier. Depending on the item, sometimes it takes a little force either trying to get it in or to get it out. It may be on other products but this is the first time I've seen the velcro be opened two ways. You have the usual way of just opening which gives you that sound of the velcro ripping away. But if you pull the flap down and away from you, it releases quietly.